I haven't posted anything recently and if you closely follow me sorry to disappoint you!! Well this is it!! The final results of the Mobile DJ system, 2 Years of R&D. Since my last update about this project, it rained for 4 consecutive weeks and I had resort to my water countermeasures (Trash bags, a tarp & a few towels). 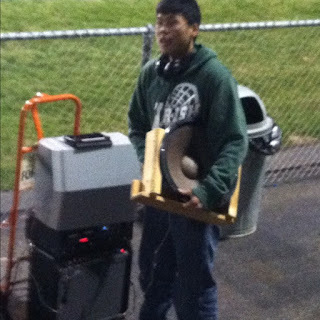 In the 2nd rainy game I used a Stereo receiver and hooked it up to 2 speakers. This was a 100 watt system so it was 40% louder and it worked quite well. 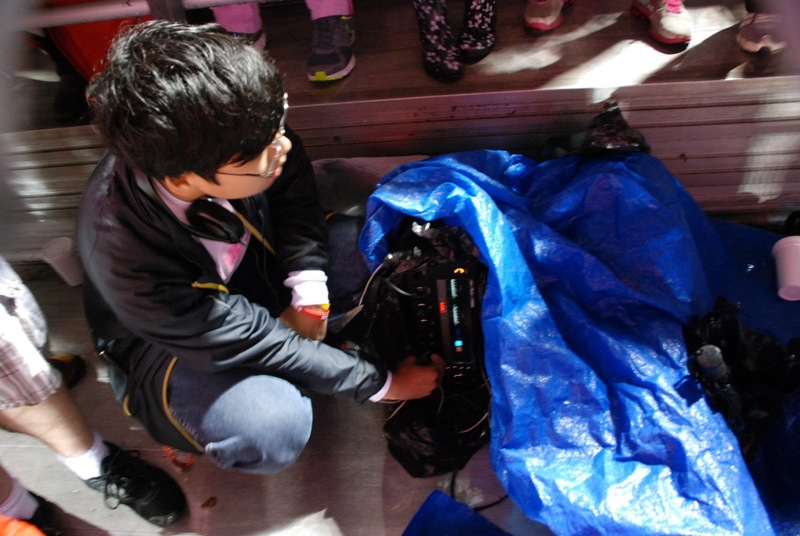 In the last regular season game I used both the guitar amplifier and the stereo receiver, and this achieved wider range and apparently the sound reached the press box of the opposing team! The Referees had to stop the game because I was playing my music to loud! Fortunately, I got some of my friends to reason with them and the crowd chanted my stage name, "DJHong"! The following week was a playoff game that we lost ,but I made some minor adjustments to make the system louder and I put of quite a show!! And let me tell you the experience is amazing!!! Our football team hasn't been to a playoff game since 2005 and this was quite thrilling! 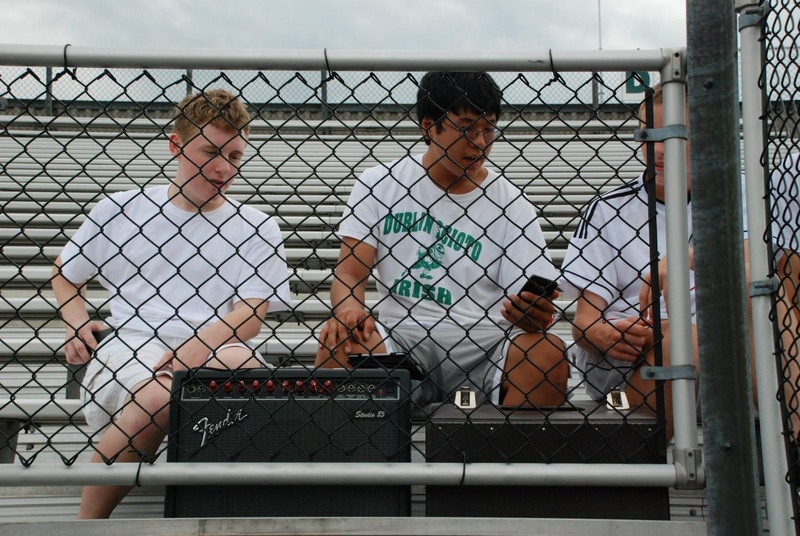 In my freshman and sophomore years our student section, was pretty quiet! In my Junior year I bought a megaphone, but that wasn't good enough! (No bass and annoying treble). Senior year I knew I had to go big! Since, I have a car that meant I had access to a potentially a mobile power source that I could simply connect to car inverters and use 120 Volts Mains AC devices. 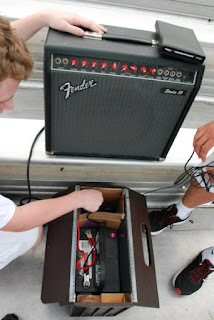 The first inverter I used was a 500 watt, good enough for the 300 watt input power requirement for the guitar amp. Once I acquired the stereo receiver, which was a class AB amp ( very inefficient ), I had to step up to a 800 watt inverter and that did the job. Now the real fun began when I hooked up the 500 and 800 watt inverters to the car battery. Two power sources and Two amplifiers equals louder and wider range output!! < This was the first time using the mobile system..
< First time using the Stereo receiver and in this picture the speakers are not visible but they are to the far right. 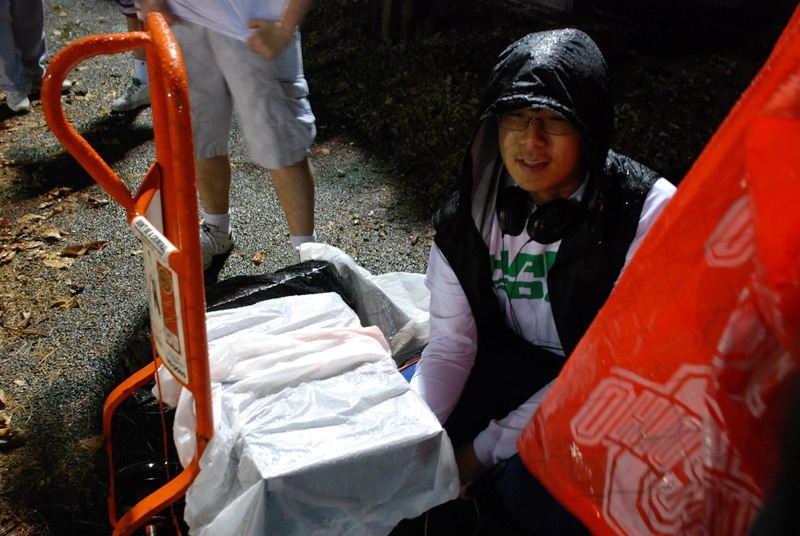 I used a Tarp to cover the equipment up because it was raining during the game. "The battle for Hard Road"
The next game was probably my biggest Gig as a DJ (Rivalry game), This game for the 4th straight week was a rainy day... This game was another milestone in that, this was the first game that I combined both the Stereo Receiver system and the Guitar amplifier. My Water countermeasures failed and some water got into the heat vent of the stereo receiver, shorting out the left audio channel! Fortunately the fuse did its job and sacrificed its self!! $1 Fix!!! This game is known as the Battle of Hard road because both schools are on the same road (Hard road) and they are about 3 miles apart. 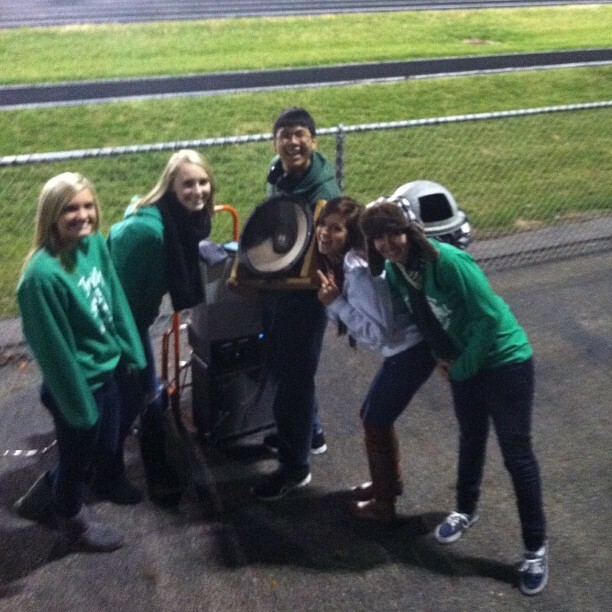 The trophy is literally a piece of the road... A 50 pound block of asphalt!!! I really like this picture because it puts into perspective how big our student section is. As you can see I am on the bottom of the picture. I use a heavy duty moving dolly to move all the equipment, now that I think about it the 2nd toughest challenge was logistics, moving the monster around. I would like to give credit to our incredible student section #IRISHNATION, Our Fantastic Football team, Our Marching band, and our parents!!! Also, Big thanks to Dan Schorr for letting me borrow his 800 watt inverter!!! Without their support I would be nothing more than a regular high school student at a football game!!! THANK YOU!!! and lets go IRISH!!! 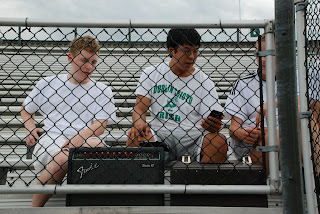 #IRISHNATION on Twitter!!! I really loved this experience, but please don't try this yourself unless you really know what you are doing. Wear proper safety protection when handling a car battery! Also, You are dealing with High voltage mains! If handled improperly, It can result in serious injury or death!!! This can also become another revenue source for you as you can sell your app for a reasonable price through the Apple's App Store! The power of this is virtually limitless! Point of within the vaginal vicinity Testx Core Having a product that works for each males and females have many advantages. These calories ought to be taken CLA Safflower Oil from sound sustenances like nuts, vegetables, natural products, entire grain and lean protein. These substance free items Dermagen IQ made with fixings found in nature Dermagen IQ for UK offer the buyer everything from delicate, shining skin to cell repair in the counter maturing items. Maybe you are as of now mindful Dermagen IQ how drinking liquor and smoking can hinder your wellbeing condition Free skin occurs for some reasons, yet among. If you ever have a slight drag when swiping your mouse, or if your mouse cord sometimes just plain gets in the way, a mouse bungee is an excellent solution to such problems. Not only does it prevent these things from occurring, it promotes smooth and seamless mouse movement by keeping your mouse cord taut.